Robert Miller’s Project Grand Slam America’s Favorite Jazz-Rock Band Taking The World By Storm with A New Album & First Ever European Summer Tour 2018! Over the course of some brilliant albums, Robert Miller’s Project Grand Slam, has re-invigorated the jazz/rock genre. Always adventurous and plainly inventive, Miller and his group has given the genre a giant leap forward. Miller’s own bass playing, clearly driving the group, is very reminiscent of Jack Bruce and is just phenomenal. If you’ve even see him perform live, you know he’s an aggressive go-to player. And, vocalist Ziarra Washington is something to behold as well. From re-imagining Brit-classics like The Kinks’ “You Really Got me”, to Cream’s “I’m So Glad”, Miller and PGS give their audiences not only an educational tutorial on those classics, but a totally satisfying show. They’ve opened for the likes of Blues Traveler, Edgar Winter and Boney James and will be performing at several festivals this summer. A: I always admired how the Beatles evolved their music from album to album, and how within each album they were able to showcase a dizzying array of songs and ideas. I try to pattern Project Grand Slam much the same – the next album being an evolution of our music from the one before, and displaying as much diversity as I can within each CD. With Trippin’ I feel that I’ve accomplished my goal. It’s a wonderful evolution of PGS, and an album that’s filled with diversity. From “1972”, my homage to the Stevie Wonder type funky synthesizer rock of the early ‘70s with Mario Castro’s fatback sax, to “Country Drive”, which could be the first ‘country jazz’ song featuring a fabulous slide guitar part by Tristan Clark and incredible percussion by Guillermo Barron Rios, to “Trippin’”, the title track, a smokin’ hot burner that the band recorded live-in-the-studio in one take. With this album I set out to drive the band more towards my rock roots, and I also wanted to add more vocals in order to show off our remarkable singer Ziarra Washington. So I wrote new vocals like “You Started Something”, “Lament”, “No No No”, and “Everyone Swears”, which are unlike any other songs I’ve written before and which all have their own groove and some very edgy lyrics. Then there are the two ‘special’ songs: “March of the Diplomats” and “Cousins”. When I wrote “Diplomats” I was thinking about Astrud Gilberto of “The Girl From Ipanema” fame. So I wrote this vocal tune that had no words and I gave Ziarra a bare melody to play around with. And the band got into it, with Joel Mateo on drums and Baden Goyo on keys lifting the song to the heavens. “Cousins”, the album closer, is the most personal song on the record. I wrote it as a kind of child’s song for my two new grandchildren who were born recently within a week of each other. It’s got a simple melody that’s repeated five times, each with a different instrumentation, with Ziarra on the high notes sounding like a flute. Just incredible. Q: “I Can’t Explain” is a great song; and, continues your practice of updating and re-imagining a Brit-classic. How did you arrive at this song? We loved your take on The Kinks “You Really Got Me.” It’s great because not only are they great songs, but it immediately telegraphs your musical-knowledge. A: Look, I grew up on the British Invasion and Classic Rock songs. They’re in my DNA. I played rock exclusively for the first 20 years of my life before I discovered jazz and the jazz fusion bands in particular. When I re-formed PGS in 2015 with the current lineup, I knew that I wanted to take one of those great songs and “reimagine” it. I was a huge fan of Joe Cocker’s version of “With A Little Help From My Friends”, where he kept the essence of the song but made it his own. I was determined to do the same. So I chose Jimi Hendrix’s “Fire”, and our recording took that great song and made it ours. On the album, The Queen’s Carnival, we did the same with The Kinks’ “You Really Got Me”, and then on The PGS Experience with Cream’s “I’m So Glad”. The Who now were an easy choice. I always adored their music and their live shows (I saw them perform half a dozen times). “I Can’t Explain” was one of their earliest hits. Total power rock. I changed it to 7/8 time, added Ziarra instead of Roger Daltrey on vocals, and Mario came up with a very cool sax figure that drives the tune. Voila! Q: For the last two albums, you had a premiere/release event at Rockwood in NYC; what’s going to be the premiere this time? A: I’m not sure if we will have the time to do a NYC premier this go round. We’re gearing up for several festivals this summer and I’m jazzed to introduce the new songs in those venues. Q: We’re still huge fans of “Gorilla” –from The Queen’s Carnival and The PGS Experience albums- it rocks live. What tracks on the new album will be the go-to-ones? A: I wish I knew what the hits would be! Personally, I love the vibe we got on “Lament”. It’s a woman scorned song and Ziarra sings the heck out of it. It’s got a U2 vibe with a bit of Adele mixed in. We’ve played it several times in concert now and it gets a huge ovation each time. Q: You’ve done some recent shows with Edgar Winter and Boney James (again); what were they like? A: Edgar Winter is amazing. Still going strong after so many decades! He was very kind and complimentary to us when we opened for him recently. So was Boney James, who we’ve now opened for 5 times. It’s amazing to me how PGS is able to win over every kind of audience we’ve played before, from rock to hard rock, jam band, jazz and smooth jazz. How many other artists can say the same? Each time we open for a legendary artist we are in effect borrowing their audience. The audience is there to see the headliner, not us. They may not even know that there will be an opening act, and they certainly aren’t there to see us. Yet each time we’ve opened for Edgar, Boney, Blues Traveler, YES, Mindi Abair, Scott Weiland, the audience – their audience and fans – has given us an ovation. Nothing is more satisfying. Q: And, you had jazz-darling Mindi Abair on “Fishin’ … what was the experience like with her? A: We’ve opened twice for Mindi who is a force of nature. Each time we rocked the joint ahead of her and the Boneshakers doing their thing. When we were recording The PGS Experience I asked her if she would play on two of the tracks – “Metro Shuffle” and “Fishin”. She graciously consented, and her playing elevated those tracks. Thanks Mindi! Q: Considering how difficult it is to break a jazz/rock aggregation like yours these days, you’ve done exceptionally well. What’s the secret? A: Hard work, great songs, great playing, persistence and luck. We’ve still got a long way to go! Q: Ziarra Washington is just a great vocalist for you; her voice and the instrumentation such a terrific matchup. A: Ziarra is just that – an amazing vocalist and a totally mesmerizing personality and stage presence. It’s no accident that the CD cover photo for Trippin’ features Ziarra front and center. As a Special Offer to Pump It Up Magazine readers, you can purchase a download of the New Album for only $8.00. Project Grand Slam – Summer European Festivals! In August PGS will be performing for the first time in Europe. On August 8 and 9 we will be featured at the Silda Jazz Festival in Norway, followed on August 11 by the Nisville Jazz Festival in Serbia. Headliners at Silda include 10CC and Roger Hodgson of Supertramp, while Nisville is the biggest and most prestigious Jazz Festival in southeastern Europe. 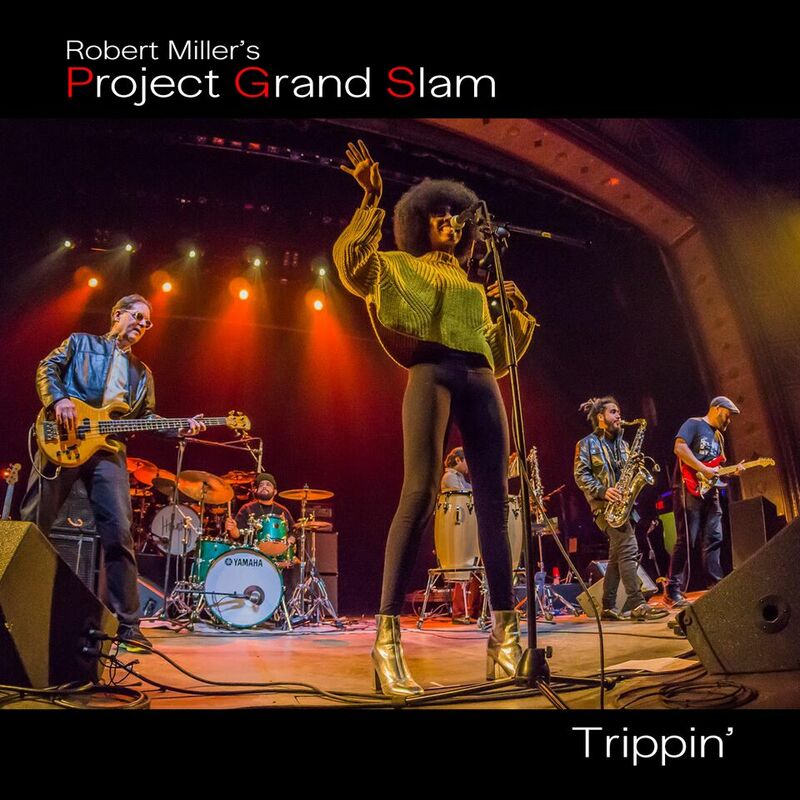 Robert Miller’s Project Grand Slam, The New Album Trippin’ On Sale Right Now!